Fighting Fantasy gamebooks – the publishing phenomenon of the 1980s, co-created by Steve Jackson and Ian Livingstone – have sold over 20 million books worldwide, and in 35 languages. Marking its 35th anniversary in 2017, the series continues to go from strength to strength. Part history and part celebration, YOU ARE THE HERO Part 2 continues to chronicle the Fighting Fantasy phenomenon. 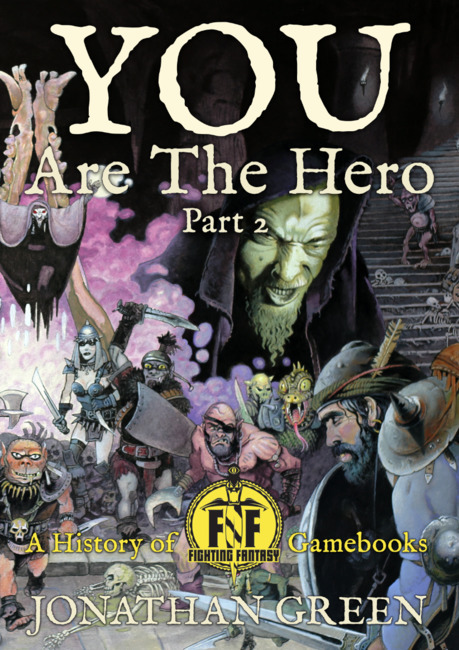 Written by Jonathan Green (author of seven Fighting Fantasy titles), this companion volume to the original YOU ARE THE HERO – A History of Fighting Fantasy Gamebooks features further interviews with the creators of the series, as well as authors, artists, editors, and games designers who have all been inspired by Fighting Fantasy’s legacy. YOU ARE THE HERO Part 2 will appeal to all those who continue to brave the perils of Allansia and beyond – armed with only a pencil, an eraser and two dice – whether they are hardened veterans or young heroes setting out on their first adventure. The book is a joy! An absolute joy! Even if you have a slimmest interest in FF this book is worth buying. Every page brings a new memory, a new fact and a bigger, broader smile! Go buy it!